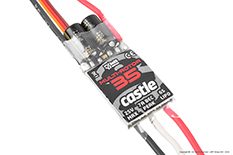 It wasn't until recently that Castle decided to spin into the Multi-Rotor market, and provide R/C enthusiasts with some of the most versatile and inventive systems ever devised. 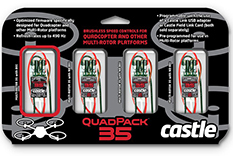 Enter the next master of the Multi-Rotor, the QuadPack 25 and QuadPack 35. 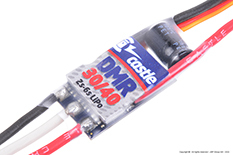 This pack of four (4) ESCs have already been optimized for use in your Quadcopter or Multi-Rotor by utilizing three (3) ESCs without a BEC and one (1) with a BEC. No more hassling with disabling the BEC on three of the ESC, this package is made specifically to save you the headache. The small footprint and lightweight design makes it the perfect choice for smaller Quads and Multi-Rotors. 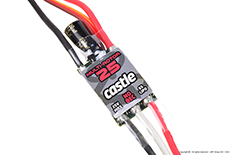 A 490 Hz refresh rate makes the QuadPack ESCs the epitome of stability during all aspects of flight from a simple hover to the most extreme maneuvers. 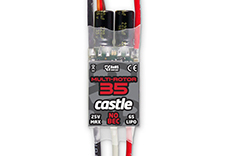 Recommended for platforms pulling up to 35 amps and running up to 6S LiPo, your Quadcopter or Multi-Rotor platform will perform as never before. 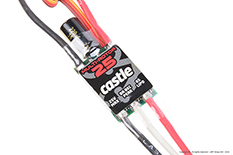 While pre-programmed for your Multi-Rotor, the QuadPack ESCs offers industry-leading software functions and USB programming capability via Castle Link USB adapter. 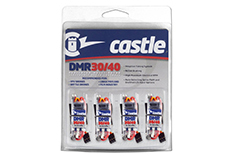 All this incredible performance and programmability at an easily affordable price.